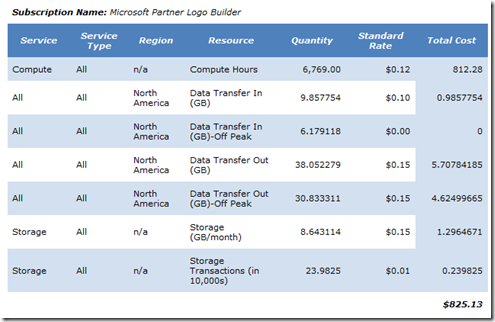 Code Inside Blog | What’s the price of Windows Azure? What’s the price of Windows Azure? The bill I’ve already talked about is from the MS Partner Logo Builder. If you want to know what this service is used to do take a look at this and this page. The 825$ are the value per month. Depending on what John Roskills (the one who posted the bill) blogpost Microsoft earned a saving of 91% with Azure. Who knows how realistic these numbers are. 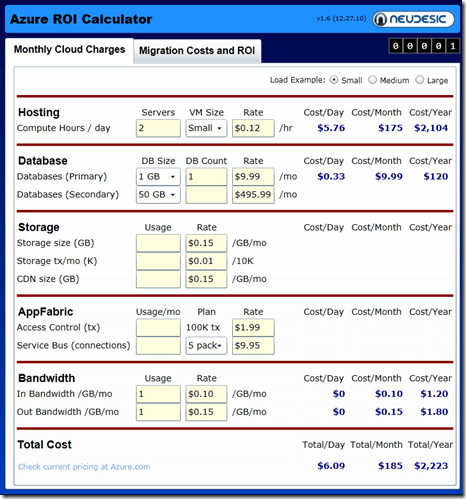 A very nice App is the Azure ROI Calculator which will help you to calculate the costs of a simple Azure application with the help of only a couple of information. There are also three types of “Profiles” (Small/Medium/Large) with example files. Small expresses almost the smallest configuration which is also recommended from Microsoft with SLA. If only one server is running (in the picture there are two servers) the SLA (Uptime of 99,95%) is not able to be warranted. The floor price for Azure is about 100 Euro (141$) (1*small instance + SQL DB + some traffic) – with a second server (which is recommended!) it will be more expensive of course. There are several offers available like for example the 90 days test or using Azure for less with a MSDN Subscription. A scheme of all offers you will find here. I don’t think that Azure is created for Hobby developer. For that the monthly costs are way too high. But there are analog costs at other “Cloudofferers” - Amazon EC2 is a little bit favorable but here you need to take care for the systems by yourself (Infrastructure-as-a-Service in opposite to Azures Platform-as-a-Service) – but both forms have their warranty I think. But of course it’s possible to host anything by yourself. Beside the “cost” argument there are several other challenges at cloud-computing (doesn’t matter which provider): data privacy is another subject.